IDF Israel Army Maerkevet Habarzel Tag. 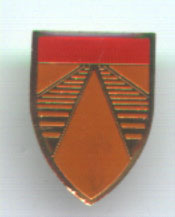 This is the Insignia of the Armor Corps. The Israeli Armor Corps is a corps of the Israel Defense Forces, since 1998 subordinate to GOC Army Headquarters. The Armor Corps is the principal maneuvering corps, and primarily bases its strength on Main Battle Tanks. The Armor Corps is the decisive corps in GOC Army Headquarters, and bases its "crushing power" on its "fists of steel": a combination of mobility, armor, and firepower. During wars, its role is, on the one hand, to lead the first line of the attacking forces and to clear the area of the enemy, while on the other hand, to block the armor forces of the enemy and to destroy its tanks and armor. During peacetime, it reinforces the Infantry Corps while it performs security tasks, with the tanks serving as a mobile bunker. Tags, pins, insignias and badges of the Israeli armed forces have been and continue to be a source of pride and comfort to Jewish people the world over, in the knowledge that today there is a military force ready to protect the Jewish people from harm, after such long suffering throughout Jewish history. This is why many people enjoy collecting these items, as each one represents the people who have carved their way to victory on the battlefronts of the middle east in order to protect the citizens of Israel. In today's day and age, we realize that the human spirit and the media are even more formidable weapons than armor, however, without this army, there would be no chance for the Jewish people to survive on the small piece of land that they occupy, and this in itself is a great miracle.